Trion Worlds announced the next major expansion for Trove, and that’s Geode – where players journey to a brand new planet. Filled with wonders and remarkable sights, Geode’s intricate series of caves will reveal new lore about Geode and its people, and bring a new, story-driven adventure to the new world. The peaceful denizens of Geode need your help. The forces of shadow have taken over the planet, forcing the Geodians to seek sanctuary on the Builder’s Spire. In their desperation, they’ve called upon all Trovians to embark on a journey to the planet, exploring its caves and utilizing its resources to help the Geodians take their planet back! Trove – Geode is the next step in Trove’s evolution and promises to have a defined, distinct feel to it. Exploration is more important than Combat, as players find collectibles and companions, embarking on story-driven quests. Trove – Geode launches this summer alongside the previously revealed Trove Bomber Royale mode. A fast and frenetic spin on battle royale gameplay, Trove Bomber Royale has up to 20 players chucking bombs at each other across the battlefield, using power-ups, and decimating the terrain in order to become the last Trovian standing! 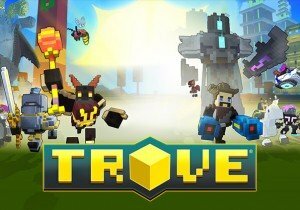 Trove – Geode launches on June 26th for all platforms. Huge news from HiRez Studios! Their partnership with WESA is teaming up with Facebook to bring the Paladins Premier League to Facebook!